Palmeiras are one of Brazil’s most prestigious football clubs, but since the start of the 21st century, they have been sorely starved of success. The end of the last millennium was a different story though, and with the backing of Italian food corporation Parmalat, Palmeiras amassed a wide range of trophies in the 1990’s: two Campeonato Brasileiro wins (1993 & 94), three Campeonato Paulistas (1993, 94 & 96), the Torneio Rio-São Paulo (1993), the Copa do Brasil and Copa Mercosul (both in 1998), and of course, the Copa Libertadores of 1999. However, at the turn of the century the Parmalat partnership came to an end. The Italians upped sticks and so, it seemed, did Palmeiras’ winning attitude. The Verdão fell on hard times, even suffering relegation in 2001. Years of mediocrity followed, and their only notable honour in the 2000’s was the Campeonato Paulista of 2008. The 2012 Copa Libertadores comes to a close tonight with the decisive second leg of the final between Corinthians and Boca Juniors. The first leg finished a 1×1 draw last week in La Bombonera, and now Corinthians have the chance to win their first Copa Libertadores trophy with a victory in front of their home fans in São Paulo. The question is: do Corinthians really have a significant home advantage? In terms of the aggregate score, they do not. The tie is levelled at 1×1 and in the Libertadores final the away goals rule does not apply, meaning Corinthians’ task is the same as ever, they need to win. In my opinion, what makes the Copa Libertadores such an intriguing tournament is the constant clash of styles from around this fascinating continent. In Europe, the playing style is, on the whole, rather homogenised. For example in this season’s Champions League group stages, Group F comprised of Arsenal, Borussia Dortmund, Olympiakos and Olympique Marseille, four teams that play very similar styles in the popular 4-2-3-1 formation. 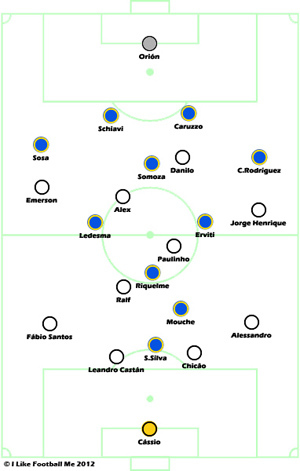 Brazilian football is certainly not short on rivalries, ranging from the friendly to the somewhat poisonous. In São Paulo state, the most populous of Brazil’s 27 federative units, the biggest clásico is between Corinthians and Palmeiras, two blue-collar clubs with huge fan-bases. The state’s other two grandes – São Paulo and Santos – class Corinthians as their biggest rivals, but while the Timão are more bothered about their green neighbours across town, São Paulo and Santos have resolved to forge a rivalry of their own, the San-São. After a brief pause in operations, Game of the Week returns to run the rule over Tuesday’s Copa Libertadores Group 8 clash between Atlético Nacional and Peñarol in Medellín. After an impressive start to their group campaign, the home side just needed to avoid defeat in order to seal qualification to the knock-out stages, while the underachieving Peñarol were already eliminated going into this match, looking to exorcise the demons of the 0x4 home defeat in the reverse fixture. Another Copa Libertadores tie for Game of the Week and from last week’s all-Brazilian clash between Santos and Internacional, we go to an all-Argentine affair as Arsenal de Sarandí hosted giants Boca Juniors in El Viaducto.